This is the most important revelation and realization you can have if you are already a follower of Christ. It answers the question why did God create me? Great men have said, “The whole duty of mankind is to glorify God.” But glorify means to manifest, express, magnify or to focus and make big a certain area. When discovering why you were created, you need to narrow this down to what specific area or career God is calling you to fill. Until you know the part that is your Divine calling, you may be wonderfully loved and kept by the one who died for you, was raised again, and now indwells your human spirit forever. But the assignment you carry is only a puzzle box containing the unassembled pieces. Although it does happen, it is rare when God speaks to someone and says, “Your purpose is to share the gospel of the Kingdom with an emphasis on raising up ministers from children who are now parentless because their mothers and fathers have died from aids.” Usually, discovering your purpose is very much like putting together, over time, all the pieces of a great puzzle. Normally you get one puzzle piece at a time and the more pieces you connect the more you begin to understand your purpose. Using the puzzle analogy there may be many pieces of the puzzle about what is your purpose that do not immediately come together or even make sense. This is normal until God brings the puzzle all together for you. Right now you may be delivering “meals on wheels” to shut-ins, but sense that you have a gift of intercession and praying that you are supposed to teach to thousands of others. You may initially feel disappointed when you lose your job and go back to college to learn Hebrew only out of boredom. If the puzzle isn’t complete yet, God might have you marry a nice man or woman who moves to Israel with you where God has you teach thousands of Israeli widows to become blessed communicators with their Messiah and intercessors for their nation. You are not your own, you are bought with a price and you are God’s workmanship. If anyone ever tells me, “You are a piece of work,” I will shout, “Yes, and How I thank God.” If not 20 years ago someone told me I would be an animal rights activist, walking in the footsteps of Paul and Jesus Christ my Lord, and being fully persuaded of these things, I could not have comprehended it. Along towards this coming climax of my earthly ministry, God, one day took all the puzzle pieces that seemed like they never should have been in my puzzle box, and showed me the bigger picture and how every piece fit together for a reason. Before that day, I treasured my wonderful Christian experiences, but I loathed the places where I failed, was betrayed or hurt. I especially had great disdain for the years before my conversion when I was physically and mentally abused before I knew God as my Deliverer and the Lover of my soul. All the horrible pieces that I hated were actually working together to make the picture God wanted me to be. I am not trying to imply that I am some finished work, but I know what my job and my purpose is as a son of God. Knowing that makes an incomprehensible difference! You can know your purpose too; just as well as you know your own name. One of many clues and a piece of the puzzle is noticing people or activities that inspire you. 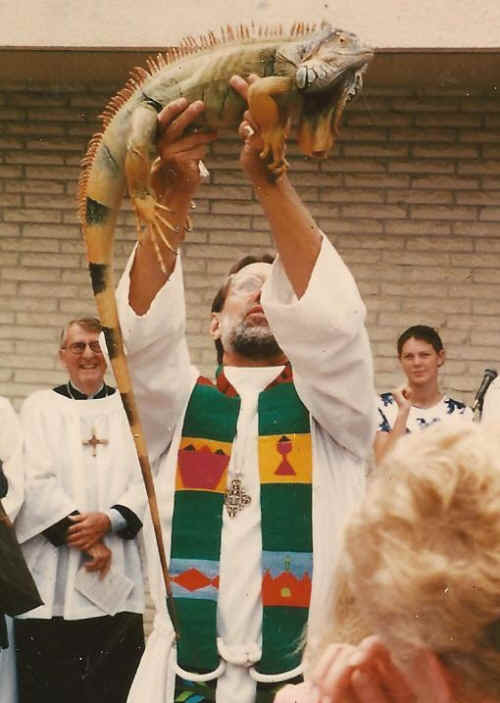 Below is a photograph of The Very Rev’d Canon Peter D. Haynes of St. Michaels & All Angels Episcopal Church in Corona Del Mar, California blessing my son’s iguana “Zen.” I covered this blessing of the animals in the mid-90’s while I was a columnist for the Orange County Register’s local editions and realized how much this meant to God’s children. Now I never awaken with some wishy-washy thought like I wonder what I am going to do this morning, or ask my wife, “Honey, who do I work for today and what is my assignment?” My conversation is in Heaven and my general occupation is bringing God’s Kingdom to Earth. Pretty good job, eh? My labor is not in vain, I never lack for opportunities. I can invest in the company of great men and women whose rewards are with them and discover endless blessings by being connected to the living saints of God. I’ll get to sit on the throne with the boss and accompanying elders and living creatures and live and enjoy my profession forever with peculiar people like me praising God continually because He is the Hand performing all things for me and I am the glove (of course, only one glove amongst a great many). God certainly is Love! Right now, ask God to begin revealing to you your purpose. Remember, discovery is a process. As you leave this little opener, reflect upon this one thought or scripture. Quietly meditate upon this for at least five minutes for the next few days. It comes from the book of Ephesians in the New Testament, chapter 2, verse10, “For we are His workmanship, created in Christ Jesus for good works, which God prepared beforehand that we should walk in them.” As you might have noticed, God has already prepared these good works for you to do. Since all the treasures of wisdom and knowledge are hidden in Christ, it is up to you to seek them out and as those specific actions are revealed, they are revealed for you to do. Only when you walk in what God shows you does He give you more. Be faithful with a little and you will get more than you can hope for or imagine! We all need to know our purpose and who we are in Christ and what is your role in that partnership. That is exactly what you will discover when you click on “Articles” and then on Discover your Destiny.